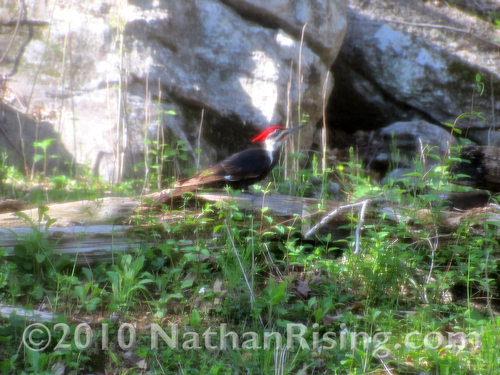 It was another beautiful East Tennessee day, and as my husband was enjoying the view while looking out our back window, he noticed a woodpecker in our backyard. The pictures are a little blurry because the woodpecker was quite a ways up the hill, plus my husband was shooting the picture behind a window. 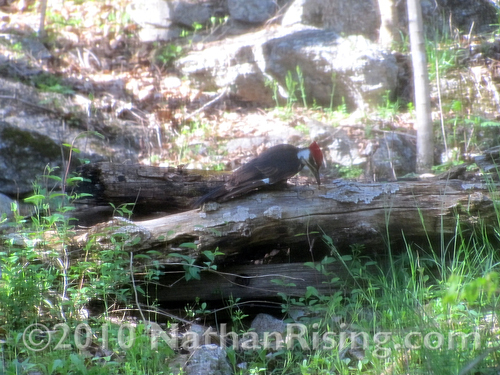 But still, it was pretty neat having a woodpecker “visit” us! This entry was posted by Jen on April 30, 2010 at 8:26 pm, and is filed under Randomness. Follow any responses to this post through RSS 2.0.You can skip to the end and leave a response. Pinging is currently not allowed. Pretty to look at, but I don’t enjoy listening to them! .-= Suzicate´s last blog ..Am I A Writer? =-. Me neither. The constant pecking can really be annoying! Loving the weather around here lately!